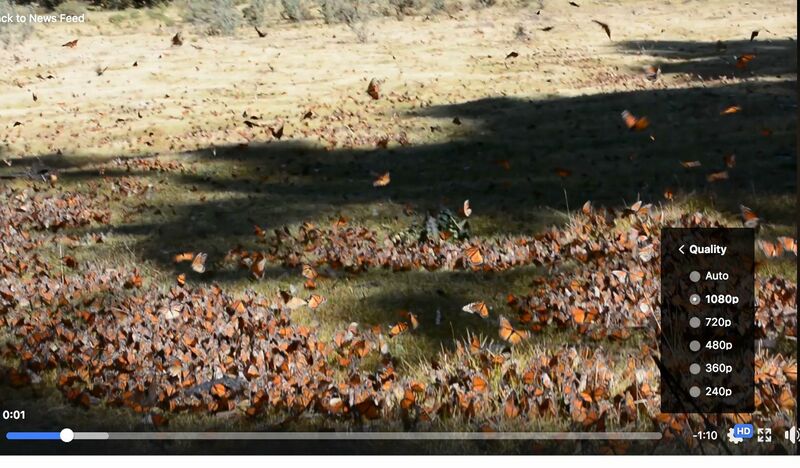 Migrating monarch butterflies finally made it to the Mexican mountains last week–late, but intact. For months, scientists and citizen scientists have been predicting the largest migration in a decade, but the insects have taken their time arriving at their winter roosting sites, missing their usual Day of the Dead arrival by almost a week, according to reports. Mexico’s Natural Protected Areas Commission (CONANP) said in a statement that the first butterflies of the season were “crossing the sky” at Chincua and El Rosario sanctuaries in Michoacán, and at the Cerro Pelón and Piedra Herrada sanctuaries in México, on November 6. CONANP said that with favorable weather, most butterflies should reach the sanctuaries during the next two weeks but wouldn’t settle in until the end of November. Estela Romero, correspondent for Journey North, confirmed the first arrivals. “We saw the first yesterday–and today they are pouring in!” she wrote on November 7. Ellen Sharp, of J&M Butterfly BnB at the entrance of the Cerro Pelón sanctuary, spotted first arrivals late last week. But the monarchs were a bit of a tease, she reported. While several dozen were spotted flying high on one side of the mountain, not much action occurred at the entrance to the sanctuary. “We caught sight of one monarch at 3:53 pm. At 3:54 we spotted our second. At 4:01, the third. And then nothing,” wrote Clark. In the Texas Funnel, the migratory channel through which all migrating monarch butterflies must pass on their way to the wintering grounds, the season has been late, unpredictable and dogged by stormy weather. Texas endured its rainiest fall in history. Much of it came in dramatic and destructive weather events, including a 40-foot rise along the Llano River where we usually tag monarchs each fall. Four people lost their lives in the flooding near Junction, Texas, just upstream from the Texas Butterfly Ranch. RVs were submerged and 24 people went missing. Clean up continues more than a month after the October 10 rain event, which was followed by even more wet weather. The deluge left fishing decks destroyed, kayaks gone missing, and riverbanks of late season nectar mowed to the ground during peak monarch migration season on our stretch of river. We found several monarch butterflies dead on the riverbank in a post-flood inspection. Well established pecan trees along the Llano where thousands of monarchs roost each fall now host batches of flood detritus. Even a 50-gallon drum of industrial glyphosate found its way onto our property. Hopefully, it was empty before it made its downstream trek. Time shifting, severe weather and subsequent life cycle surprises were not limited to the Lone Star State, however. As winter approached and Daylight Savings Time kicked in November 4, online communities along the monarch flyway shared stories of late season sightings and tardy hatches of chrysalises holding monarch butterflies. Another correspondent spotted a lone monarch in Chicago the same day. Unfortunately, there’s no easy answer to that one. But here’s a post that might help. The schizophrenic weather seemed to break the migration into disjointed parts in Central and South Texas. A big pulse of monarchs arrived in mid October, followed by a break, then another rush around Halloween. Longtime monarch tagger Jenny Singleton of Grapevine, Texas, tagged 450 monarchs near her Hill Country ranch on October 13. Chip Taylor, founder of Monarch Watch, the citizen science tagging program based at the University of Kansas at Lawrence, says things are changing, but it’s still too early to declare a trend. “Yes, this is another late migration relative to the arrival at the overwintering sites…November arrivals are unusual (6-7 Nov this year) but have happened in the past, most recently in 2014 when they arrived much later,” Taylor said via email. Rain and cool temperatures created on and off conditions for monarchs moving through much of Texas, he explained, followed by similar situations in northern Mexico. Andy Davis, Assistant Research Scientist at the Odum School of Ecology at the The University of Georgia and editor of the journal, Animal Migration, thinks the trend is pretty clear. Citing numerous studies indicating the impact of climate change on the monarch migration, Davis suggested we’re in for more seasons like 2018. Warmer weather will cause monarchs to breed later in the season and result in delayed or missed cues about when to start migrating. Only time will tell whether or not this year represents a new pattern for the monarch butterfly migration cycle. What does climate change mean for Monarch butterflies? Monarchs are still moving west along the coast in Pensacola, FL. Exciting to hear they made it to Mexico! Now to see how they fare this winter! The Native Prairies Association of Texas owns or holds easements on over 4000 acres of Native Texas Prairie! All of our prairies provide vital habitat for monarchs, other important pollinators, and even horned toads and prairie dog! You can be a member of your very own prairie country club! Join or donate at http://www.texasprairie.org. Thanks to the Butterfly Ranch for being such an important partner in educating the public about pollinators! JoAnn Collins Outreach Coordinator Fort Worth NPAT.